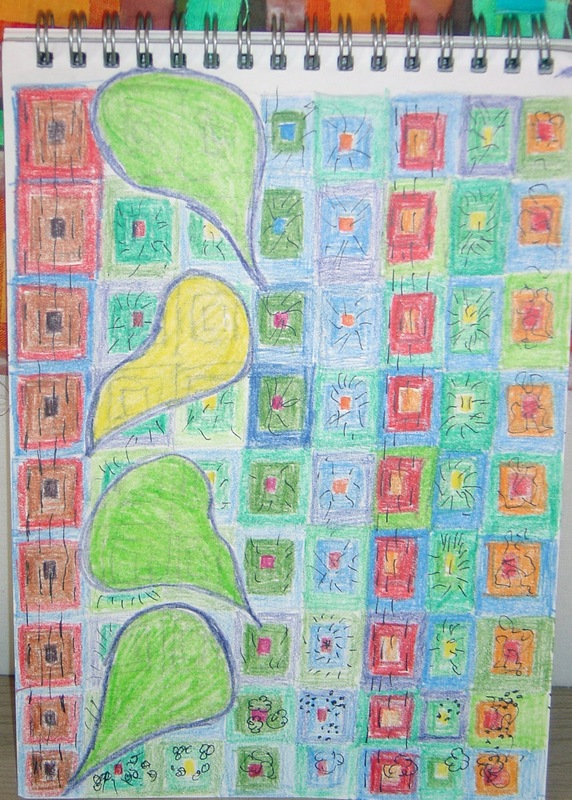 I wanted to share theses images showing the work of one of the ladies taking part in David Hockney challenge. Olga explains in her own words the influence of Hockney and how she is interpreting this in her design. 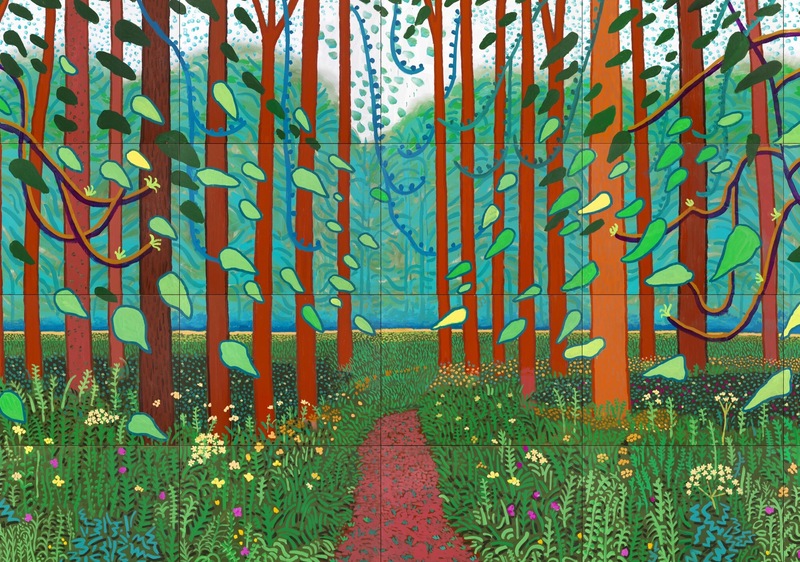 “I first became aware of David Hockney through a television programme about his forthcoming exhibition at the Royal Academy in 2012. It was the colours he showed in the landscapes that made me look around and search for those colours. I found them in the surrounding landscape, but realised he paints them with more intensity and energy. I didn’t get to the exhibition but did splash out on the catalogue. At the same time I was getting into dyeing my own fabrics and using the cold primaries as in the Ives Colour Wheel. When this challenge came up I chose from the catalogue, the painting The Arrival of Spring in Woldgate Woods. 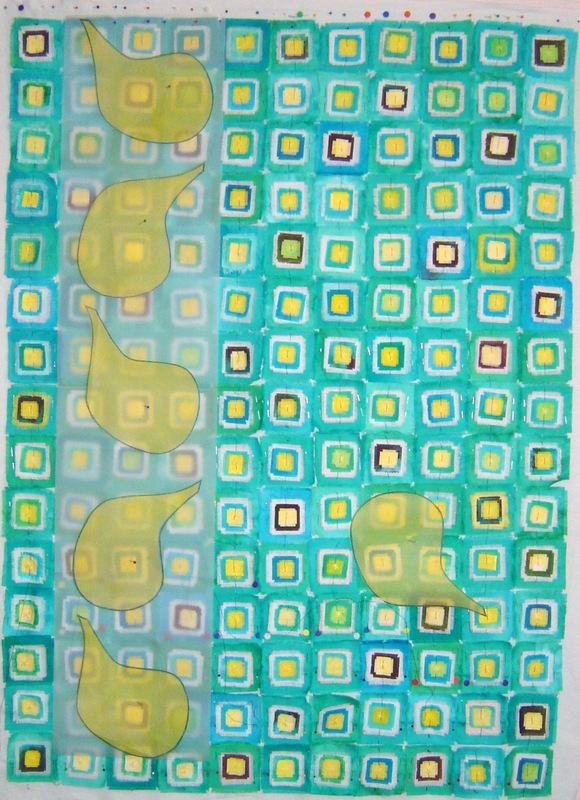 I liked the vibrancy, energy and movement in the painting and those three elements are the inspiration for this quilt. I like working with layered squares, and I like frayed edges. Initially, as can be seen in my sketch book page, the quilt was to have more colour, I was thinking about the colours of the tree trunks, and I tried lots and lots of different permutations, but wasn’t happy with the result, so settled for different shades of turquoise (Procion dyes) as the background, with a, light, dark, light, layering, and small amounts of brown/red, trying to make it POP, i.e. give it a bit of energy. 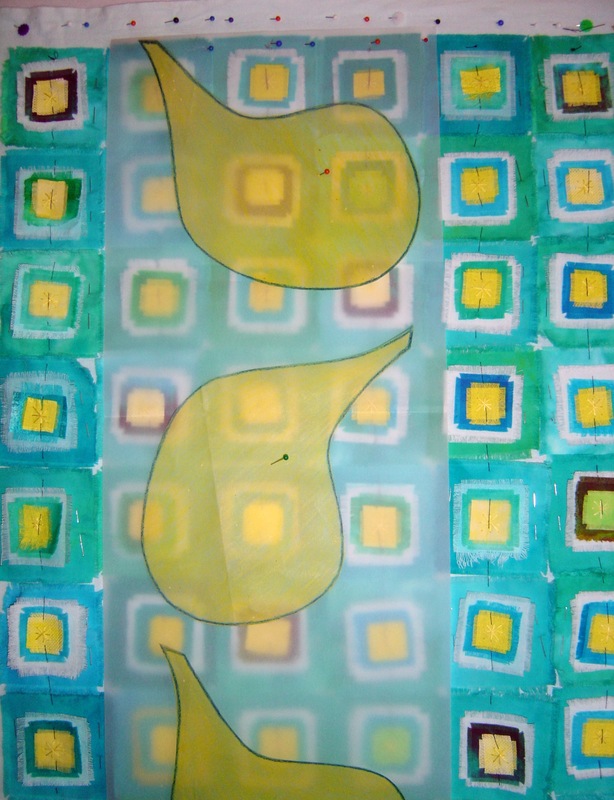 In the painting the leaves falling from the trees are outlined in blue, and I am planning to have a strong vertical line of falling leaves, down one side of the quilt, with a balancing leaf on the right, possibly in sheer, layered fabrics, possibly Lutrador, and with a blue outline. In these photographs I am trying it out with translucent paper.